IT IS LAURA CANTY-SAMUEL’S job to play like a kid — a costumed, well-rehearsed, hilarious kid — up to eight times a week. 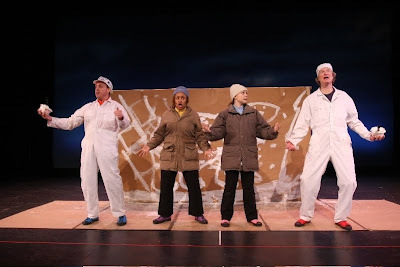 With her ensemble cast, the Paper Bag Players, the grown-up actor plays a polar explorer, a nervous student, a tree and a bathtub, all to engage the very youngest of audience members in theaters around the Northeast. The New York City-based company has added Brooklyn to its circuit in this landmark year, as they celebrate half century of skits, jokes and make-believe with “Make a Little Room for Me!” Following a debut appearance at LIU’s Kumble Theater on Feb. 28, they hope to keep the Downtown Brooklyn venue as a regular stop. 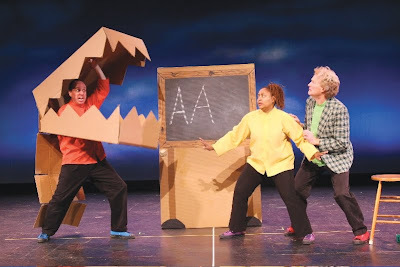 The ensemble uses simple objects to create imaginative props and scenes, in the hopes of not only entertaining but also inspiring audience members to go home and do the same. “The most important thing we convey to kids, with boxes, craft paper and paint, is they can reuse things they have laying around them to tell a story,” says Canty-Samuel, who has raised two daughters in north Crown Heights. Her husband CRAIG SAMUEL, owner of Brooklyn restaurants Smoke Joint, Pig and Peaches, was born and raised in Brooklyn. Canty-Samuel first performed with ‘The Bags’ when her oldest daughter, Tiara, now in college, was little. After watching her mom roll back and forth across the stage as a meatball, young Tiara told her, “I want to be a Paper Bag Player when I grow up!” Canty-Samuel took a long hiatus and rejoined the cast again just two years ago. Her second daughter, Alana, is now a student at Brooklyn Friends School. The Bags travel as far as Florida, Maine, Chicago, and in the past, Japan, to perform for children. When they hit the road, everything can be packed flat into three large cases in the “Paper Bag Van” — but out of those cases can be assembled (depending on the season) bicycles and taxis, an alligator or fully set dinner table, a giant broom, foot or cat. Kids are taught to be respectful and quiet when in a theater, but “we show them, it’s all right, jump in!” Most of the material is designed for 4- to 9-year-olds and for many, it’s their first time in a theater. She is thrilled the Bags are Brooklyn-bound. For tickets to either the 11 a.m. or 2 p.m. show on Feb. 28 at LIU’s Kumble Theater, One University Pl., visit kumbletheater.tix.com. Tickets are $15. Howe’s Brooklyn Dust Off That Business Plan With BPL’s PowerUP!